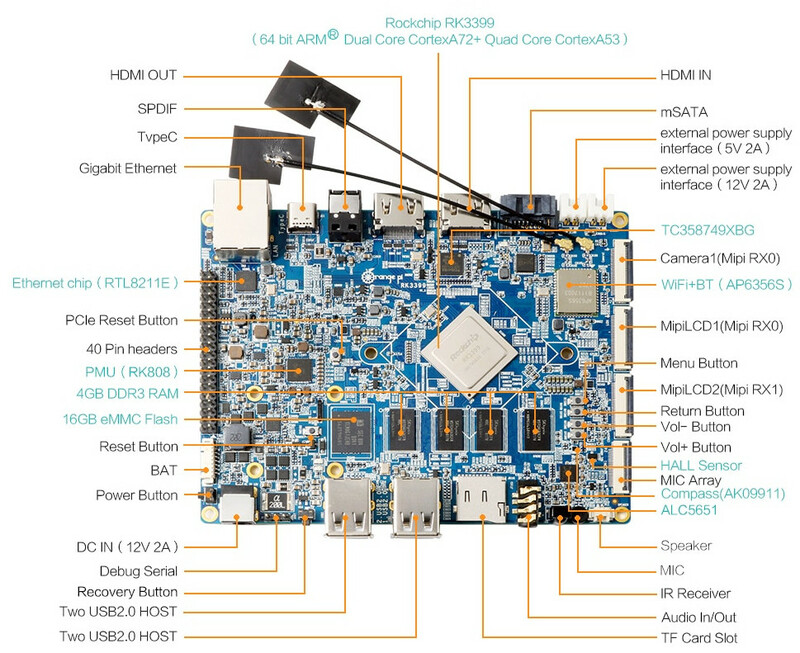 Orange Pi RK3399 development board launched last year, further crowding the RK3399 space. The board did not target the lower end of the market with a $109 price tag, but still came with only 2GB of RAM. Shenzhen Xunlong has now introduced a 4GB RAM version of the board for $99.96, with the 2GB version now selling for $89.38. Both boards can be purchased on Aliexpress. Software-wise you’ll find Android and Ubuntu/Debian desktop/server images that have last been updated in February / March of 2018 in the download page, as well as the Android SDK and Linux source code. The community appears to have focused on lower cost RK3399 boards such as NanoPi NEO4 or Rock64Pro, and for example, there’s no Armbian image for Orange Pi RK3399 board, even one suitable for testing (WiP). That’s funny. RK3399 with 4GB DDR3 — does anyone remember the official reason why Hardkernel canceled their N1? PS: There seems to be a typo in the first sentence (crowdfunding). The DDR3 status was end-of-life (EOL) and in short supply (six months ago). This affected availability and pricing. They also stated that they wanted four years of availability which was not possible (likely due to EOL), so they decided to use a newer and better SoC instead. I thought it was the memory supplier dropping the part which would have forced them to redesign the board to use different chips. “Some months ago when I still joined Armbian forum” … have you left the Armbian forum? Why? I leave forums where people who don’t know what they’re doing have moderator permissions and mis-use them to censor stuff they don’t understand. SATA functionality is provided by an USB3-to-SATA bridge (ASM1153E) which probably means the SATA port and mSATA usage are mutually exclusive. Performance with spinning rust will be fine, with SSDs random I/O will slightly suffer compared to a PCIe attached SATA solution (sequential performance will be fine at around 400 MB/s). The other USB3 port is available as USB-C. All four USB2 receptacles are behind an internal hub, while the other USB2 host port is routed to the mPCIe slot (so USB available on pins 36/38 for WWAN modems or other USB only mPCIe cards). Why weird? You just need the appropriate use case for this board. Up to 5 different displays to be connected, MIPI CSI and HDMI in, mPCIe/USB + SIM card slot for cellular connectivity, HDD or SSD easily integrated, 4 ports for common USB peripherals. 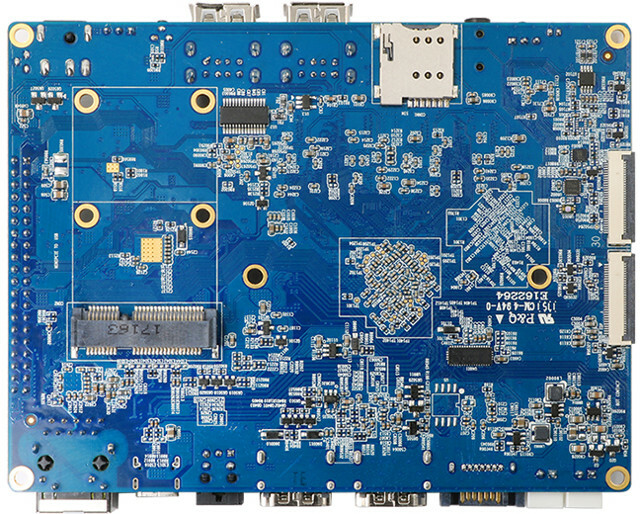 When Hardkernel designed their ODROID N1 over a year ago they only used a single PCIe lane to connect such an ASM1061. They believed RK3399 wouldn’t be suitable to saturate more than a single Gen2 PCIe lane (for whatever reasons). Since Xunlong designed the RK3399 board above a lot earlier maybe they also believed into RK3399 + PCIe would not be working? PCIe is also a driver thing so testing PCIe with RK3399 back in 2017 might have been a real sh*t show? Those RK3399 vendors who started earlier made some design decisions that look somewhat weird today when looking at and using later RK3399 designs. OK now got your point. Might be an explanation for those design decisions. Still for me personally a rockpro 64 makes more sense. Or any of friendlyarms offerings once there will be pcie hats. Do you know if the HDMI input of this board can be used in Linux? For example as a capture device or IP encoder. I know most of the SBCs with HDMI input are either not supported by software or only suitable for pass-through. The problem with HDMI input is that most of the HDMI feeds have HDCP encryption, that’s why they don’t work. I do not know the specifics of HDMI input on the RK3399 but I’m sure they aren’t going to give you a HDCP decryption key. Please see ‘TC358749XBG’ mentioned above on one of the pictures. Well Aliexpress says they have sold 50 2GB boards and 2 4GB boards, such high volume sales, for all that design and work. Not forgetting taxes. The 4 GB board is brand new. Plus, it’s only Aliexpress, the whole volume within China goes via Taobao or other channels. International sales may also go via ebay or Amazon marketplace or retailers. So I think the volume should be higher than that. If it’s meeting the expenses, no idea. But Xunlong probably gets some government support, so don’t worry about them. No housing, no cooling, no Armbian (yet). Why should I buy this board (yet)? I like the hardware, but housing, cooling and software is imperative.